Today I was able to throw a pack on and go for a little hike. This is the first hike that I have been able to go on for the last few weeks due to my back surgery, so I was thrilled to get out there for a little bit. When we arrived I used the My Tracks app I downloaded on my phone to see how it worked. It did a pretty good job in my opinion. Below are the results of the app. The only bad side is that it pretty much killed the battery on my phone keeping the GPS on for 4 hours straight. I actually turned the tracking off right as we were about 5 minutes from the truck, so the beginning and ending is slightly off. 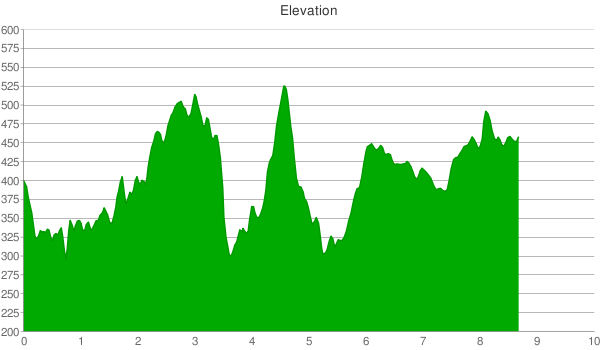 The map, stats, and the elevation chart was all from the Google map from my My Maps page once I sent the track to the maps page. I am impressed with the app, and will continue to use it. My buddy Rick and I drove out to Big Hill Pond State Park this morning around 9:15 or so. Being a relatively short drive we arrived around 9:45ish. We got all of our stuff together and took off. We parked down near the boat ramps and headed up the north side of the lake. This part of the trail is right on the edge of the lake, so it’s a great place for snakes. Last year while I was here with my son I very nearly stepped on a water moccasin. This time, lo and behold, very near the same spot as last year rested another fairly large snake. He was laid up on the side of the trail fairly well disguised in the brush. We did not even recognize him till we actually passed him. I am not sure what kind of snake he was but he was big enough for us to know not to mess with him. He quickly took off back towards the lake and I missed the opportunity to take a pic. (Just so ya know, he was a solid color, kinda right between black and brown, and with a rounded head.) 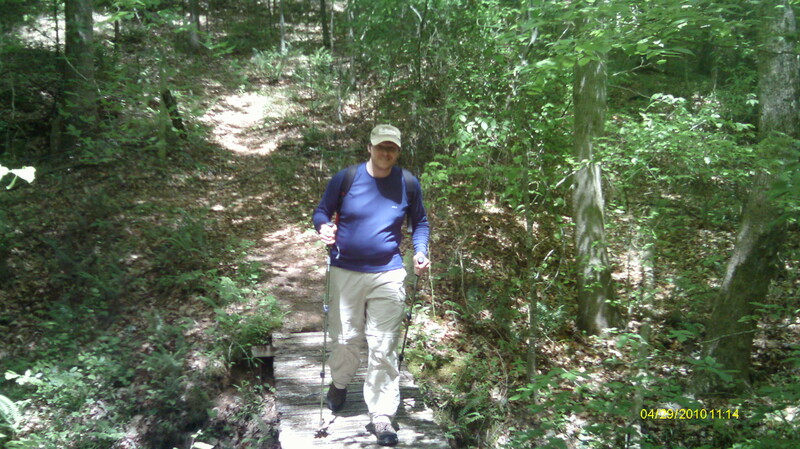 So we continued the short trek north and then began making our way around the north end and more into the woods. After we crossed the North end of the lake we continued on, following near the edge of the lake for a short time, then we eventually began to drift farther and farther away from the shores of the lake. We didn’t see any more serpents but we began to feel the bugs. We hiked on and eventually we came to a large, well, like a concrete vat. I am not sure what it was used for, or even when it was used, but it was neat and we stopped at it for a moment and got a drink and a breath. We continued on and hiked some more. 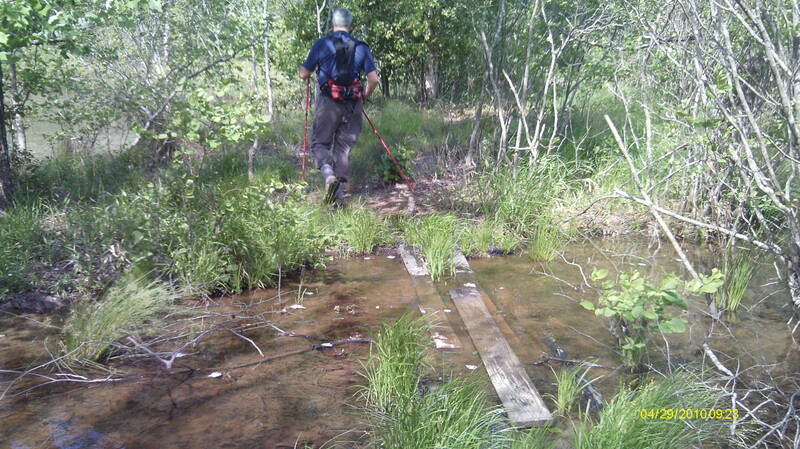 The trails are in pretty good shape for the most part, however there are some rough parts (both the condition of the trail, and the trail itself). Alot of the trails here are shared with horses so it is not uncommon to run into a group of people riding horses on the trail, or the evidence of horses on the trail, whether it be hoof prints or poop!Today we did not run into anyone riding horses (they were all probably at work, or something) but we did come across the evidence……a few times. 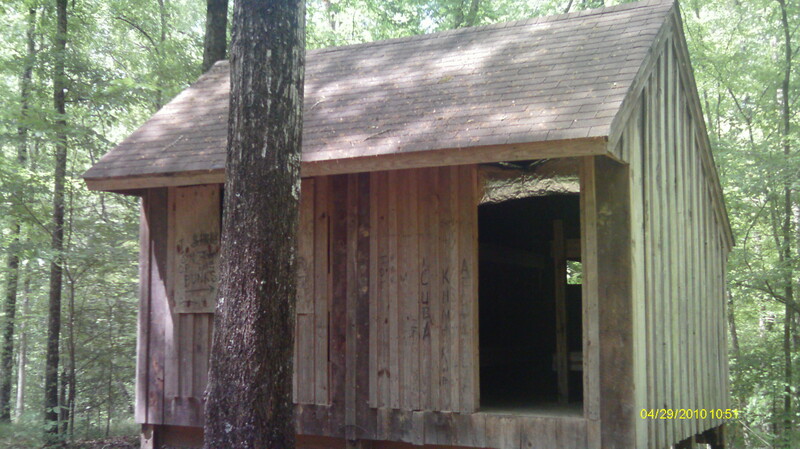 We continued on hiking for a while and eventually came to the Tuscumbia Bend Shelter. This shelter is a little ways off the trail, and it is in a very confusing place. 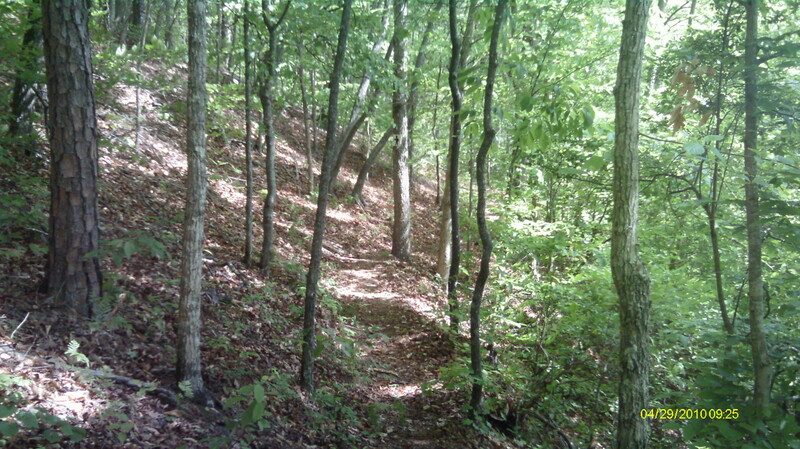 There are a few trails that intersect with a few old roads all at the same place and they are not well marked at all. I have gotten lost at this area a few times in the past, even with a map. Some of the trails have been moved too I believe. 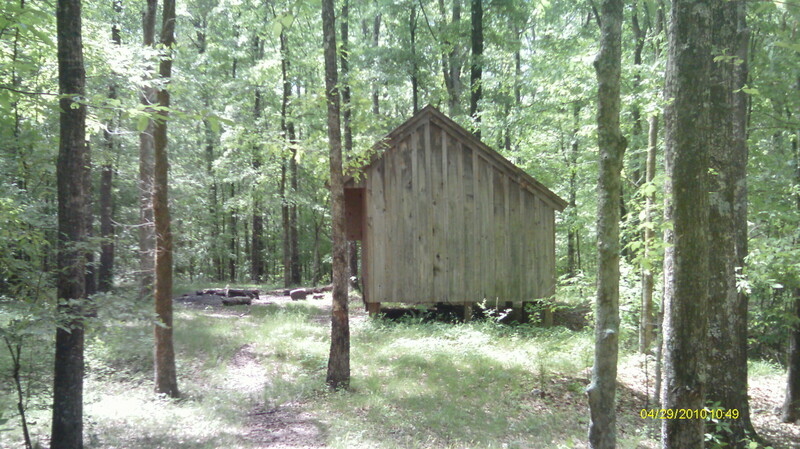 I finally found this shelter last year with the help of the friendly ranger and with the use of a Mule (the 4WD kind). 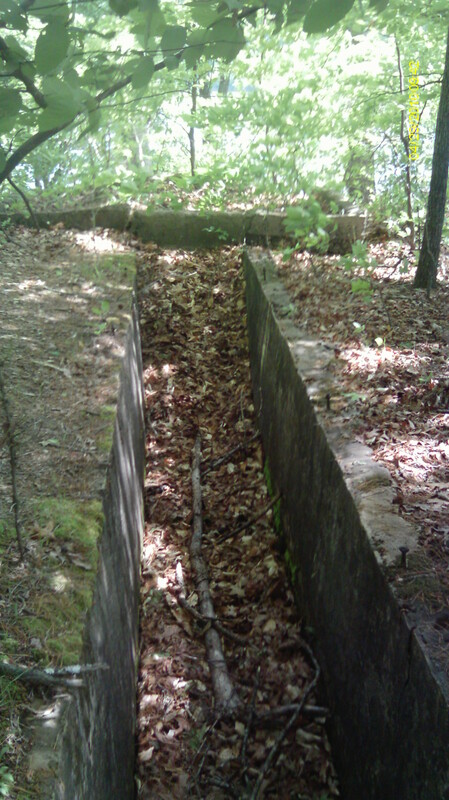 Last year when he finally took me out here to show me the shelter he told me that 3 of the 4 shelters found here at Big Hill Pond had been inhabited by long-eared bats. Also, the bats had become “endangered” so the bats had their home to do with what they wanted. Sure enough when I gazed inside there the ceiling was full of bats. So I did not know what to expect today when we arrived. I peered inside the shelter, and it appeared empty (except for some Dorito’s bags, Olive oil, some propane and other various objects). Upon actually crawling inside the shelter and letting my eyes adjust, I noticed one little bat perched from the top of the vaulted ceiling. I let him be, but I noticed him checking me out…..
After we left the shelter we looped back just a little and continued on our path. 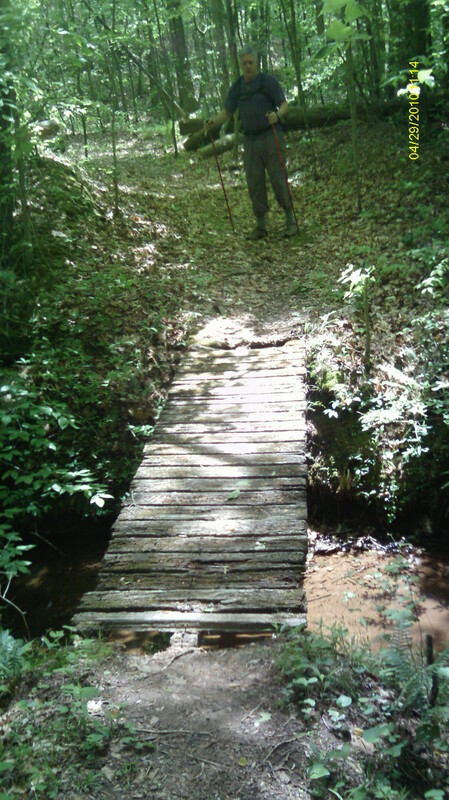 We immediately crossed an old wooden bridge that is in much need of replacing. After crossing this bridge we headed up hill. This was probably some of the harshest incline that we encountered on our hike today. It was pretty rough, considering I have been sitting on my tail pretty much the last 4 weeks. It was fun though. We both thoroughly enjoyed being out there today. The day was beautiful. Blue skies. Nice breeze. Beautiful country. Ever once in a while the sun would warm us up, but it wasn’t long til we were back in the nice shade again. So, we marched on. We soon came to a fire tower. The fire tower is some 75 feet high. We hung around the base for a minute and caught our breath from the haul up the hill, then I ascended the tower for some pics. 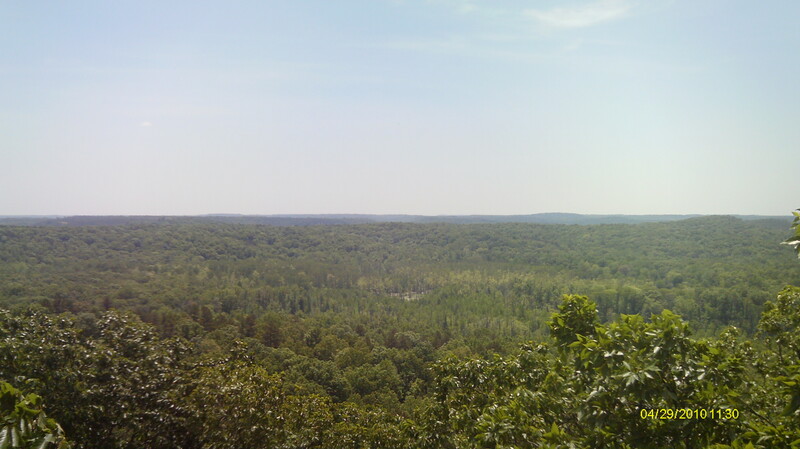 It really is beautiful from the top of the fire tower. It is a nice place to set and enjoy a nice lunch or snack. While at the fire tower we met our first hiker while here. A young girl came up just as we were about to hike down the other side of the (large) hill. She came bee-bopping up in flip-flops and we were both slightly shocked. She told us that she had come from across the Boardwalk and then we were a little less shocked, as a parking lot is right on the other side of the Boardwalk, and that wasn’t far away from the tower. However it was our current destination. We hiked down the hill. It is one of those hills that is so steep it almost makes you run down. However our trekking poles kept us from doing so. We made our way to the Boardwalk and crossed the boardwalk. 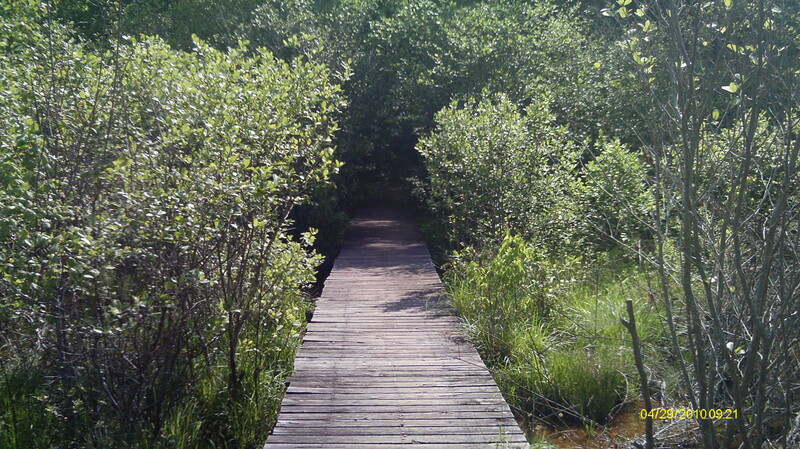 The Boardwalk is an elevated walkway that runs about 1/2 mile through a swampy area. 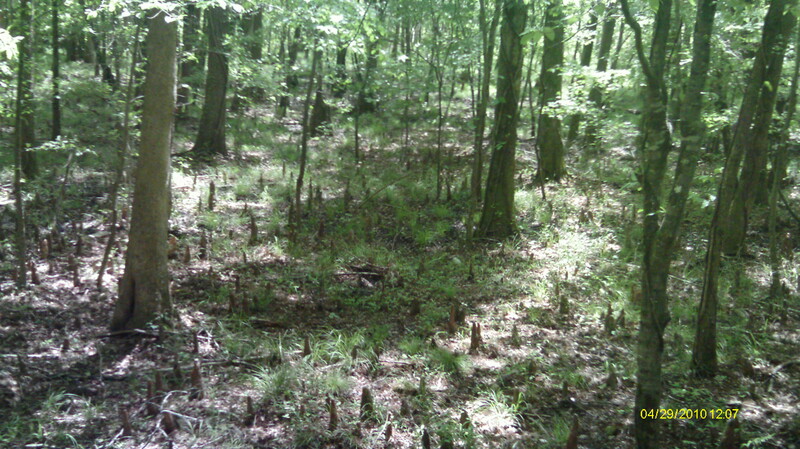 There are little Cypress knobs sticking up everywhere so it looks pretty cool walking through there. 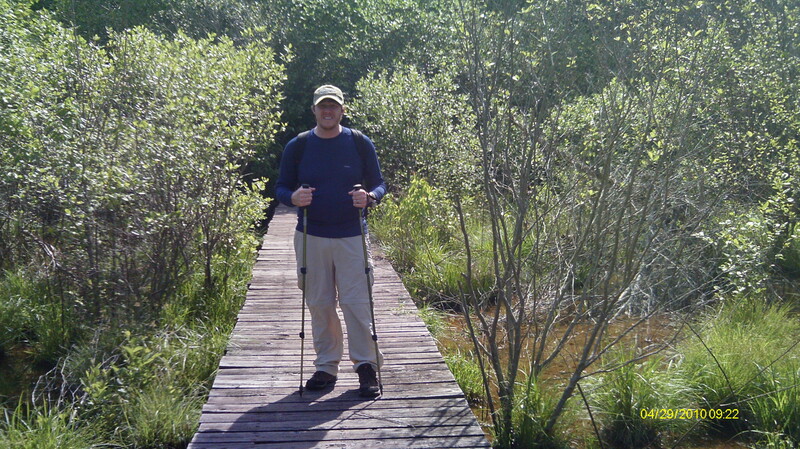 We crossed over the Boardwalk, carrying our trekking poles so that they wouldn’t get stuck between the cracks between the boards along the walkway. We came out the other side and finished the short trek up and out of the woods to the parking lot. At the parking lot we had a few options. We could continue on straight ahead and follow a road that would eventually lead us out. We could head down towards the dam and loop back around the edge of the lake, or we could hike out on the road. Since I was on a time restriction we opted out for the road. However it was still approximately 3 miles from where we stood back to the truck. So we took off. The first 2.5 miles were down a gravel service road. We easily took that out, however we encountered more spots with less shade so it made it a fairly hot exit. We finally made it back to the paved road and continued to the truck. 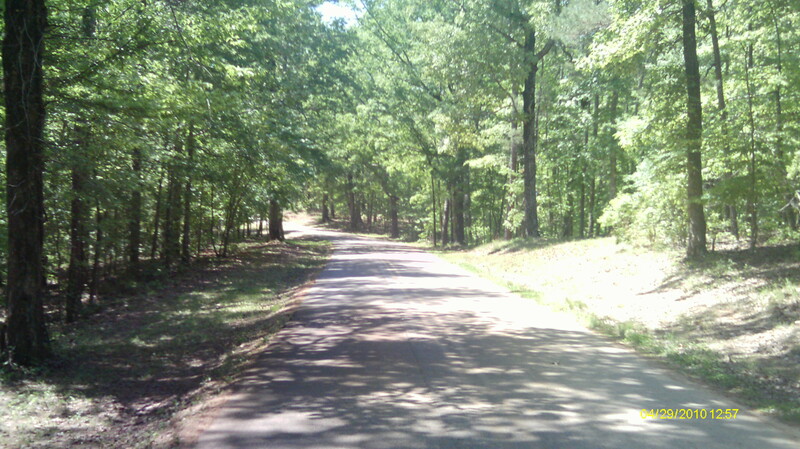 While hiking down the paved road, I myself was bee-bopping along just looking ahead at the road, waiting to see the truck. All of a sudden I heard Rick telling me to “Stop, Stop!” I looked down and I was almost standing on a small green grass snake. He slithered off unharmed, and I luckily escaped unharmed! (haha) We got back to the truck around 2:30ish. We loaded up our packs and our poles, got our drinks out and loaded back up in the truck and headed home. Like I said, this was my first hike in a while (actually since the end of January), and to top that off I have been sitting on m tail for nearly the last 4 weeks recuperating from my back surgery. I started walking a trail at the city park the middle of last week, so this was great for me to get out and do. And it wasn’t too shabby, at least by the stats that the My Tracks app provided. Now I am just looking forward to doing it again! Chad glad to see you out and about doing the things you love. Love to see what you have you done. Glad you didn’t get snake bitten. Enjoy the time you have off work and be careful. Glad you had a nice outing! 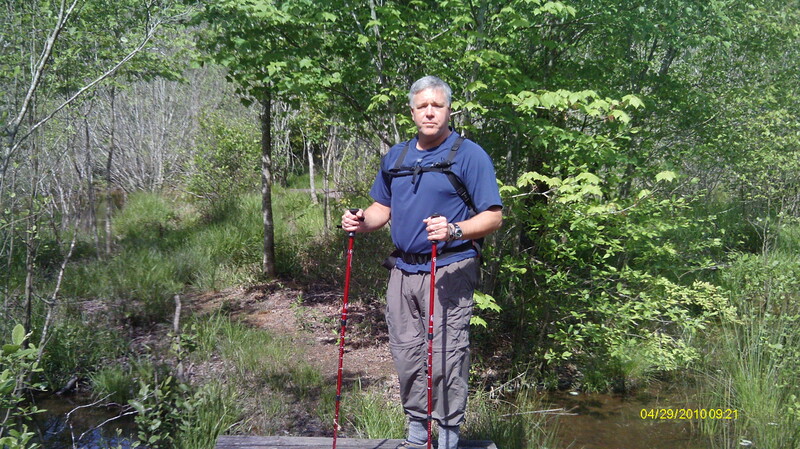 It sure does take a long time to get your “hiking legs” working again….trust me!